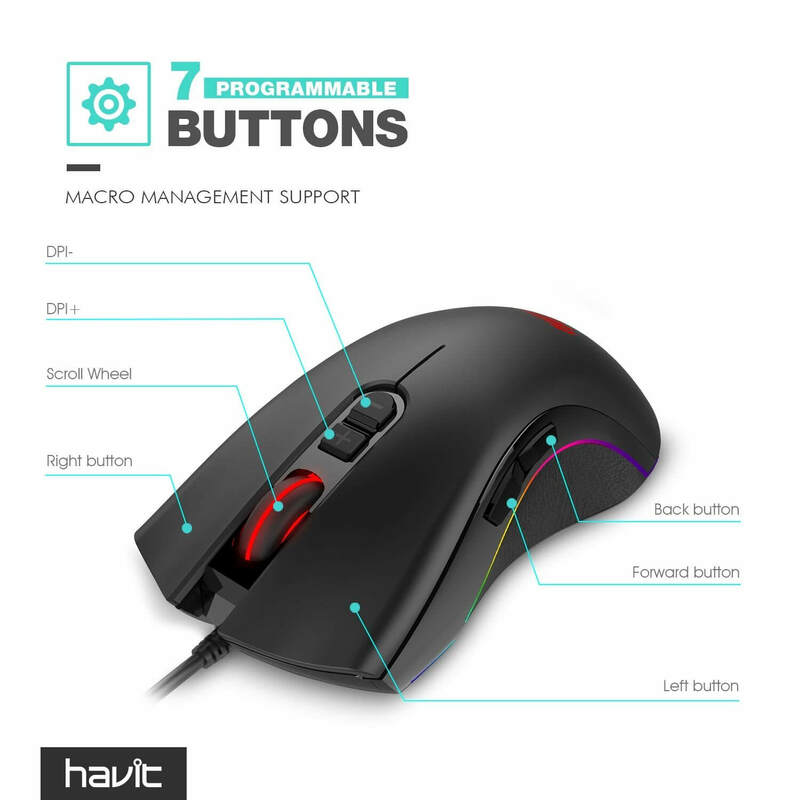 HAVIT HV-MS794 Programmable Gaming Mouse provides macro setting via the driver, you can set the buttons to perform particular actions in your games as your want. HAVIT HV-MS794 Programmable Gaming Mouse adopts high quality AVAGO A3050 professional games chip, ensure quickly switch for different games. First off, I bought this mouse for $1.80. With that said, it is worth it’s current selling price of $18. I have larger hands, and I have trouble finding a mouse that fits comfortably at a reasonable price. Until this one, the complete list was comprised of the SteelSeries Rival and Razer Deathadder. This one is fairly heavy, which I like, and is very responsive. The software that goes with it is nice as well and all things combined are not the type of thing you get from a mouse that is under $20. 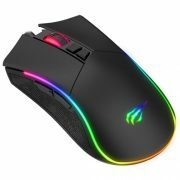 Great gaming mouse with low price! It support my Mac book pro. 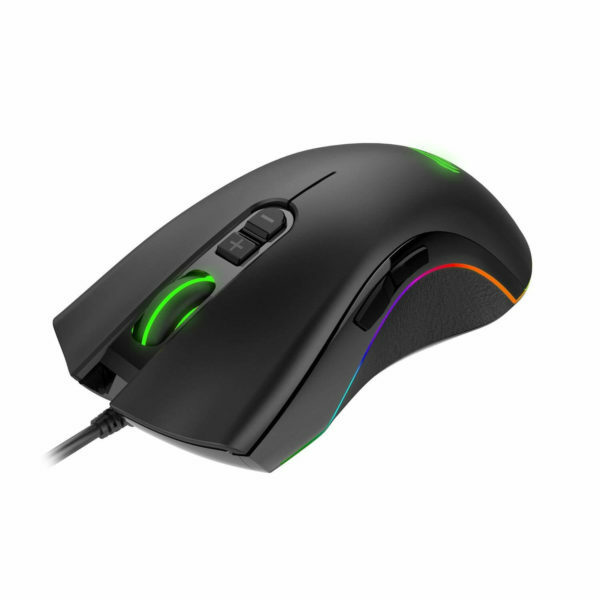 I use it to play League of Legends with no problem.The most things than I like for this mouse is it can change color. Great quality and great deal! I really like the feel of this mouse. +The coating on it feels great and seems like it will stop the slippage from the mouse that I occasionally experience. +The clicks on the primary buttons feel satisfying. +The side buttons feel pretty good to click as well. +I really like the mouse wheel. It’s pretty big which I really like. Plus it lights up! +As a guy with medium to large hands, the mouse just fits. It’s larger than the mouse I was previously using which makes me very happy. It has a ring finger rest as well as a little thumb rest. It feels extremely comfortable to handle. +The software is really nice from the limited experience I’ve had with it. The amount of customizability is great. From dpi, to lights, to refresh rate, etc. I like the software a lot. Overall, great mouse so far. If I remember, I will update later down the road with anymore positives/negatives I run into as far as longevity goes. Easy to install. Looks very cool. Easy to adjust LED lights display mode. It’s fantastic for the night using. i love this gaming mouse! 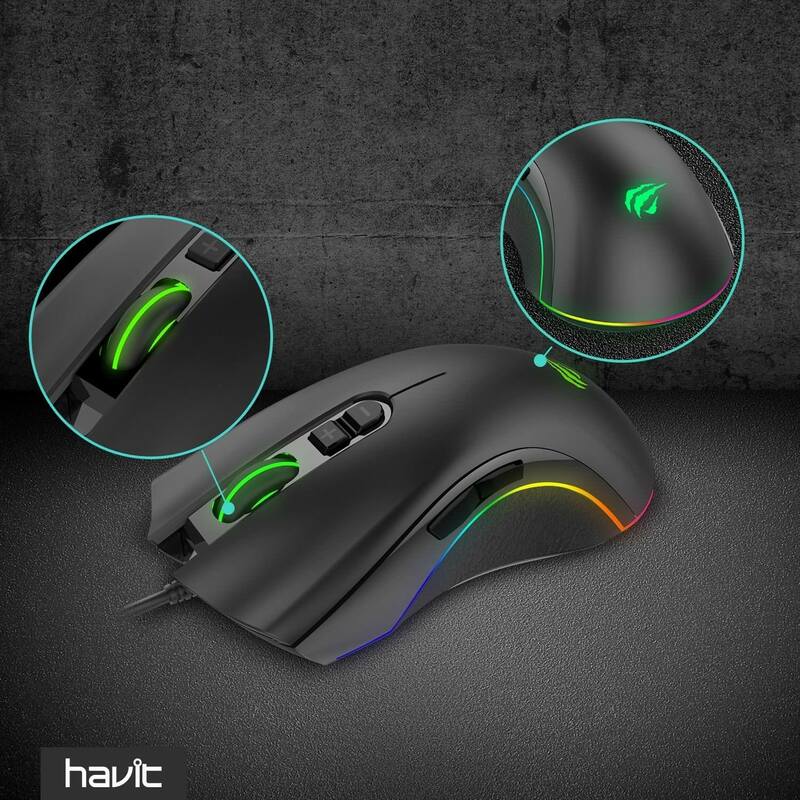 There’s a forward/ backward button on the left, it has multiple LED colors that can be chosen, and three speeds that can be selected from at the bottom, for those that like fast mice, this one is great! It changes speed at the flip of a button! This is a plug and play mouse, in other words when you plug it in the computer recognizes it immediately without having to download anything or make any additions. That’s always nice. The cord is sturdy, bend-proof, and the entire mouse is built to last. It glides easily, looks great, and the slider button works well also. Very impressed. Love this mouse! great design (multi color light flow so coool)and customize function. Feel comfortable when playing game and writing paper. The programming function works fine and I like the lights on it. Solid built, the cable seems to be rugged, just a little heavy though. Terrific Mouse !! Just had it for a week and love it !! RGB software is amazing and easy to use. Size and weight is incredible. There’s also a little resting place for your ring finger which i found to be a great addition ! good looking, lights are changing over time. a little bit bigger than expected, but still can easily handle. can get full functions on the windows computers. The mouse fits in my hand very well and is really comfortable after long time gaming. Also, the design is cool, with LED lights shining in the dark. It is nice gaming mouse with good quality! Considering the price is pretty low, I would say it is beyond my original expectation. I use it to play Dota2 with no problem. Also it is easy to install and LED lights feature is definitely a great plus. I found this mouse a good fit to my new gaming laptop. The buttons are easy to locate and remember for gamers at my level. 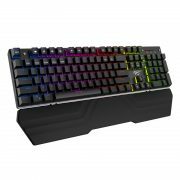 So far, there has not been any problem with the operation and it did not make my hand tired even after hours of gaming. I think it is a right choice for an everyday gamer. This product is very good! It is functional and well designed. By the way, the USB line is also long enough and it seems it can be used for a quite long time. At first, I did not expect too much from this mouse since it is cheap. However, the great quality shocked me. This mouse is very heavy and reliable. 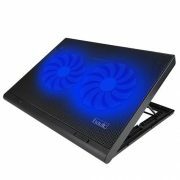 It is perfect for gaming as well as surfing internet. I will highly recommend this mouse and will buy another one for my wife. This mouse is incredible! The first thing I noticed about it is the weight. It weighs much more than my previous OEM mouses. This is a good thing, as it feels very sturdy. 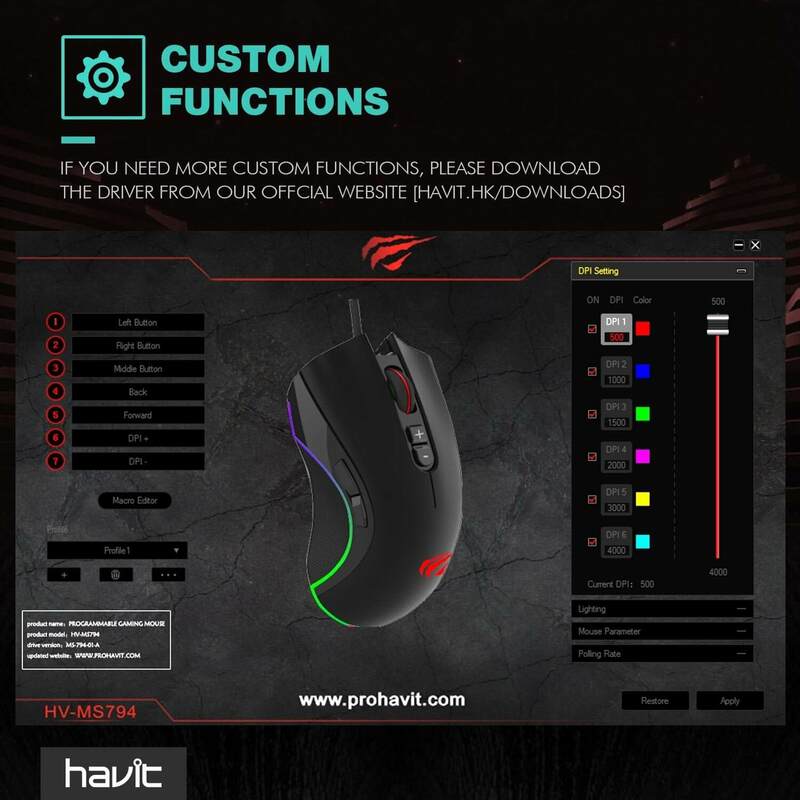 This mouse also has customization software where you can manually tweak the light patterns for each DPI setting, and also customize the min/max DPI. This mouse has stepped up my Overwatch game so I’m very thankful! My only con is that on rare occasions, when I press the DPI buttons it will actually minimize my full screen games. This doesn’t happen very often and luckily I only change my DPI when I switch heroes on Overwatch, so there’s time for a quick minimize. I purchased this gaming mouse to replace my old one. So far, it works well. The sensitivity is good. I​ don’t know much about the mouse, i only knows that it changes color and have many modes good for playing game. I purchased this for my fiance. he loves to play the game. I don’t like the look of his mouse, so i decide to buy a better looking one for him. He said this mouse is a lot better than the one he used before for around 2 years. Comfortable to use with convenient button settings! my kids thumb it up. Very nice gaming mouse, good quality and low price! RGB led changing light is so beautiful! Gonna suggest my friends to buy it! The first mouse I got had a loose part inside and rattled like a dog toy, I contacted the company and they immediately sent out a replacement after sending a video of the rattling and it’s awesome! 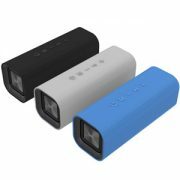 Great product and great support. This mouse is the best all around mouse i have so far come across. 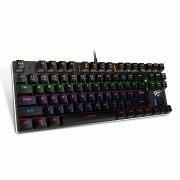 The software for costomizing the extra keys is easy to use and first setup. All of the bottons have a nice tackile feeling. 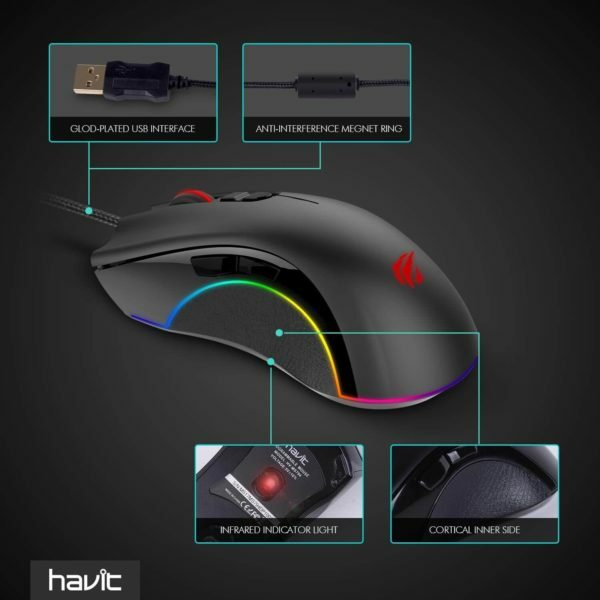 This mouse can be used for nonprofessional gaming and any household or work related job you throw at it. the product works fine. the hand is very comfortable. the only thing is that some sound inside is dreary. Good mouse for the price. DPI range is good and accurate. Weight is about what I would use if it were adjustable, so no complaints that it is not adjustable. I don’t really care about LED lights, but these turn off, so no issues there. Very happy with this product. No complaints at all. got a great deal on my mouse, I loved it so much I ordered another one for my work PC!! The rgb software is great for changing the lighting scheme and the mouse has some great weight to it. I seriously love this mouse. 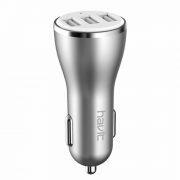 The cord is sturdy, the lights are very customizable, and using the program to customize the buttons is simple and effective. You can set different profiles with different button configurations and light settings. The ergonomics are nice, with a good spot for all of my fingers. I wish it were just a tiny bit smaller, but I wear a woman’s glove size small, so that’s expected. Even so, it’s pretty comfortable, and I’ll get use to it pretty quickly. Great product, useful, amazing controlling system, wonder color choices! This mouse was surprisingly cool. For the price it exceeded my expectations. It has excellent packaging, the ‘out of box’ experience was a joy. This would help make it an excellent gift choice. It has a durable cloth braided cord and solid construction. The ‘light show’ is a lot of fun, multi colors that my whole family enjoys. I have big hands and it feels really comfortable to use. The sensor is quite sensitive and so the cursor movement is so smooth that I really enjoy using it while gaming. This gaming mice and the feel is absolutely perfect. I also like the rgb lighting. Anyway, best mouse on the market. When the mouse first came, I noticed there was a rattling noise inside. I found some other reviews that mentioned this just to make sure I wasn’t the only one. I plugged it in anyway and there seemed to be no problems, but I messaged the company anyway. They were very helpful and sent me a replacement mouse. This one has no rattling and I’m very happy with it. Great customer service! I’ve only had a basic two button mouse for fps games. Using this mouse is a huge upgrade to my gaming experience. I recommend downloading their drivers online to customize your colour scheme and mouse preferences. Very comfortable gaming mouse and pretty good hand feeling. I like this mouse very much, specially the lights. If you play shooting games, this one will be perfect. This mouse is an insane deal. The colors are amazing, and the software for it is so nice, didn’t expect that for a $20 mouse. And then the feel is great too, I like a small mouse better, but I still love this. Don’t forget to take off the protective layer on the mouse grips on the bottom, I hadn’t noticed and the mouse felt really heavy. This will look real good with my LED keyboard soon. Excellent mouse!! Build quality is very good, buttons feel good, scroll works as it should. During normal desktop use it’s nice but for games it even better as it is very accurate.